No matter how involved the medical aspects of an injury or its treatment, you'll be able to understand them all--along with their practical legal implications. 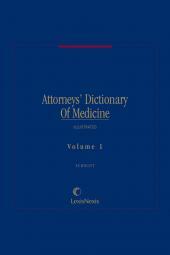 The Attorneys' Textbook of Medicine puts you in complete command during the examination and cross-examination of medical experts and enables you to communicate in lay terms that jurors can clearly understand. 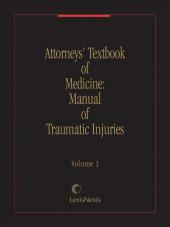 In addition, backed by hundreds of illustrations, diagrams, charts, tables and checklists, this classic research aid is essential for any attorney trying a personal injury, medical malpractice, or workers' compensation case. Current authors: Various flat-fee medical writers.